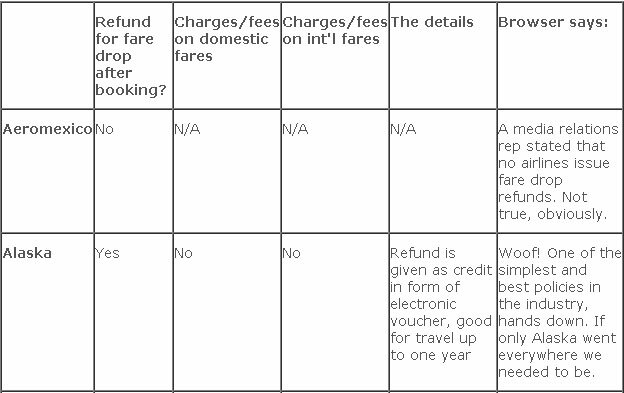 Different airlines have different policies on refunding your money if the price drops on that non-refundable ticket after you purchased it. Don’t get going on those fine prints of every airlines because Airfarewatchdog compares airline policies in a chart for your reference. Well, if the fare difference applies to the exact same dates of travel, exact same flight times, and exact same “fare bucket” (you know, those wacky fare codes like Q and K and T and Y), then some airlines will give you a fare drop refund. But many will not. And even most of those that will issue a refund are going to charge you a fee for doing so. For instance, it’s not publicly disclosed anywhere, but JetBlue will refund the difference if you ask for it. Virgin America and Airtran give credits good for one year, and, no surprise, Spirit doesn’t give any refund or credit.